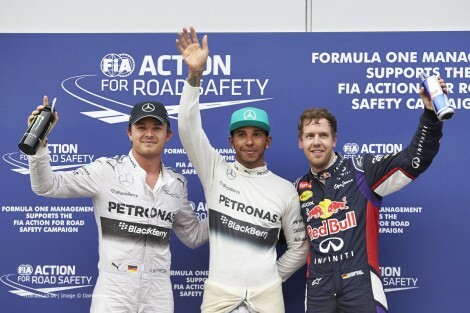 Home » Formula One: Hamilton gets second pole in a row in Malaysia! 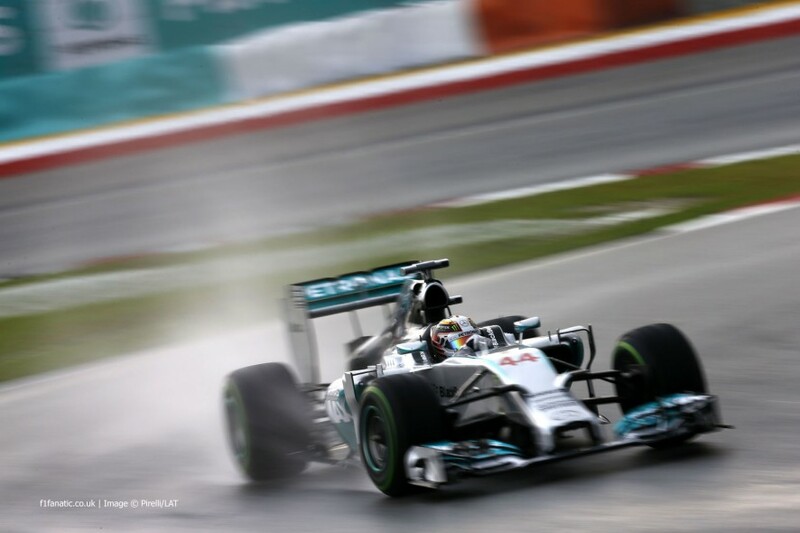 Lewis Hamilton has taken pole position for the 2014 Malaysian Grand Prix at the Sepang International Circuit. The Mercedes driver scored his second pole position in two races, after a similar wet qualifying to the Australian race two weeks ago. Sebastian Vettel was only six hundredths of a second down on Hamilton and took second place on the grid ahead of Nico Rosberg. With Hamilton and Rosberg having taken first and second in the final practice, Mercedes were hoping for a front row lock-out as qualifying approached. 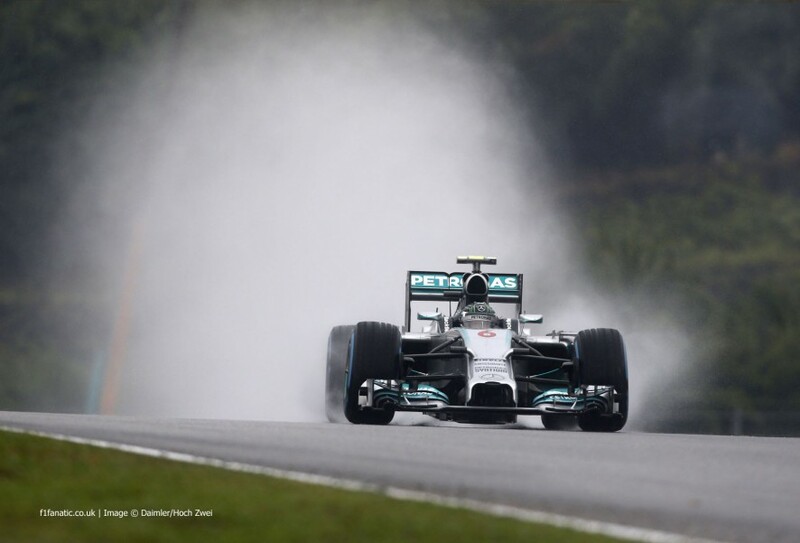 Qualifying was delayed by fifty minutes due to a downpour of rain, almost a tradition of the Malaysian Grand Prix. All the cars queued up at the end of the pit-lane to head out on track, with the two Silver Arrows leading the field away. A majority of the field were out on the Intermediate tyres, with Nico Rosberg taking the provisional top spot ahead of Hamilton. Daniel Ricciardo moved up into third, with his team-mate Vettel returning to the garage with a problem. Sebastian’s RB10 was soon back up and running after a restart for his energy recovery system. The world champion got back out on track and immediately jumped up into third place, four tenths off of Rosberg. The McLaren’s didn’t the same pace as they had in Australia, with Magnussen 12th and Button in the drop-out zone as the clock ticked down into the final few minutes of the session. Button managed to drag his McLaren into the next session, knocking out Pastor Maldonado in his Lotus in the process. Adrian Sutil seemed to struggle throughout the session and had to settle for 18th place ahead of Bianchi, Kobayashi, Chilton and Ericsson. The two Caterham drivers were desperate to out qualify the Marussia’s as it was one of the home races for the team. Ericsson seemed a little too desperate however as he lost control of his car on the exit of turn three and smacked the barrier before slewing back onto the circuit; narrowly missing Esteban Gutierrez in the Sauber. The Swedish driver had never driven a Formula One car in wet conditions and managed to climb out of the cockpit, with the experience certainly making an impact on the young rookie! Once again the Mercedes were at the head of the queue at the start of the second session. 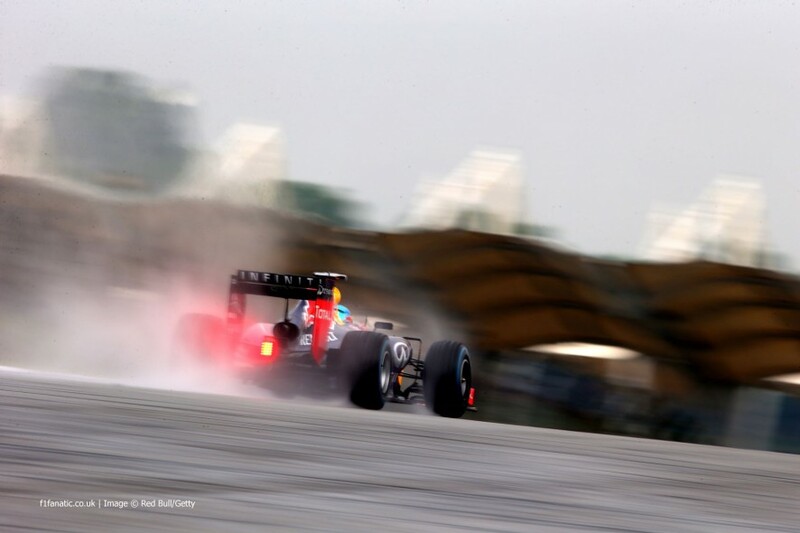 The rain had intensified near the end of the first session, which meant that most of the drivers were on full wet tyres. Ferrari were an exception with both cars on the Intermediates. The decision looked to be a mistake as Raikkonen complained of aquaplaning. Alonso wasn’t very lucky either, with the Spaniard coming into contact with rookie Daniil Kvyat when the Russian attempted to pass on the inside. The contact left Alonso with a broken suspension rod and debris on the circuit which bought out the red flag. Alonso managed to get his car back to the pits, with the Ferrari mechanics able to fix the car very quickly. With the session back under-way, Lewis Hamilton took the provisional top spot, one second ahead of Rosberg in the sister Mercedes. The two Red Bulls soon split the Silver Arrows, with Vettel in second ahead of Ricciardo in third. Rosberg then managed to fight back in the final minutes to retake second. A battle ensued for the final few positions for the top ten shoot-out. With six minutes remaining, Gutierrez, Massa, Button, Kvyat, Bottas and Vergne were all in the drop-zone. Button managed to scrape his car into tenth place, with team-mate Magnussen having a moment at the final hairpin. The rookie lost control of his car and ended up in the gravel trap, but somehow managed to coax his car out and back into the pit-lane. There would be no more running in Q2 for the Dane who was in 8th, so it was a nervous final few minutes as he waited to see whether anyone would knock him out. Button improved up into 8th place, with Kvyat moving into tenth. Vergne then popped in a lap that was just quicker than his team-mate’s to put him up into the top ten shoot-out. Valtteri Bottas had a poor qualifying down in 15th, but was then given a three place grid penalty for impeding Daniel Ricciardo during the session. For once it wasn’t the Mercedes cars who were the first out on track, with Raikkonen and Button being the first to emerge. Both Button and Magnussen took a gamble to go on the Intermediate tyres, with Kevin soon peeling into the pits, complaining that it was too wet. Raikkonen set the first time with a 2’01.218, but it was annihilated by Hamilton a few seconds later who put in a 1’59.4 to take the provisional pole position. Sebastian Vettel came through on his first lap to go a few hundredths slower than Lewis. Fernando Alonso set the third fastest time ahead of Nico Rosberg in fourth. The drivers came in for a change of tyres and reared themselves up for a final lap for pole. The rain was intensifying slightly, which meant that it was becoming increasingly difficult for anybody to improve upon their times. There was a traffic jam heading into the final hairpin as all the drivers tried to get some space for their final attempts. Sebastian Vettel made an uncharacteristic mistake in backing up too much. The chequered flag came out just before Vettel crossed the line, which meant that the German didn’t get another attempt at pole. Rosberg did however, but he couldn’t dethrone Hamilton from the top-spot and had to settle for third as he jumped ahead of Fernando Alonso. Hamilton tried to improve upon his lap, but made a mistake and ran wide at turn four. This didn’t matter however, as he had already secured pole position for the Malaysian Grand Prix; equalling Jim Clarks record of 33 pole positions. *Three place penalty for impeding for Valtteri Bottas.